As you will have read on the summary relating to RTS Antiques and its partners I have always had a real attraction to the Staffordshire figures made by the Alpha Factory. The word “factory” is probably a misnomer as I think it is now widely acknowledged that many of the Staffordshire figure producers were actually “pot banks” or cottage industries probably situated in the back yard of a relatively humble property where a kiln had been built for that purpose. There were many such “factories” dotted in and around the towns of Staffordshire now affectionately and indeed appropriately called The Potteries. In my view Alpha figures were all produced by one modeller and one manufacturer and that production took place between 1840 and 1853. 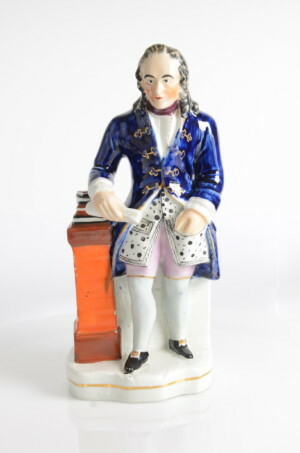 The reasoning behind this statement is that all the figures that Alpha apparently produced carry many similar characteristics such as the clay with which they were manufactured, the choice of overglaze enamel colouring and painting and gilding techniques. I shall go into these particular characteristics in another of my blogs. The Staffordshire figure during the Victorian era was the poor man’s forerunner to today’s rather more expensive limited edition pottery. They were made so that the working class man or woman could display household ornaments of well-known characters of the time. The modeller was probably the most important person in the factory. It was he or she who identified the person or animal to be modelled (often from a print or picture) and was the individual responsible for shaping and sculpting the original design and forming and creating the master figure from which the first mould was made. These moulds, once created, made it possible for the same figure to be created time and time again by using the mould repeatedly. The result is that today we find there is a similarity in characteristics from factory to factory which are usually identifiable by the style of moulding and modelling. 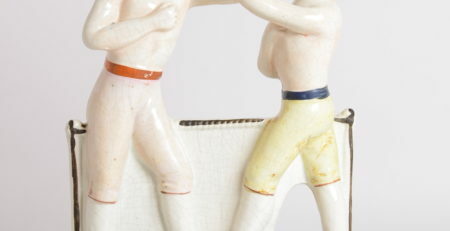 Staffordshire figures are infrequently marked by their manufacturer. It was Thomas Balston (His collection is presently housed in the Wedgwood Museum) in his book “Staffordshire figures of the Victorian Age” who first noted that manufacturing characteristics often gave away the manufacturer and he recognised the traits of the modeller and manufacturing techniques of the Tallis factory (now more commonly known as Thomas Parr) and Alpha itself. I have some 300 figures that I believe were made by Alpha and in the coming months I will publish photographs of figures that are definitely recorded as Alpha and some that are unrecorded but which I will show exhibit all the characteristic hallmarks of the Alpha factory. I would welcome and encourage discussion from other Staffordshire, and in particular Alpha, enthusiasts who could contribute to the debate. Photographs from others are and will also be welcome.